Stephenson aired what appear to be solidified plans on WarnerMedia's data sharing strategy with CNBC's Andrew Ross Sorkin at the Fintech Ideas Festival on Wednesday. 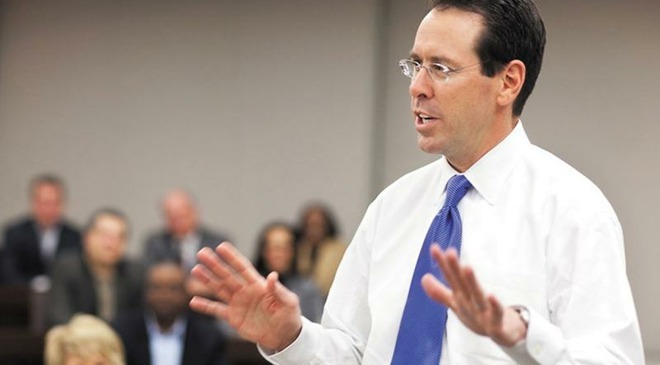 Of note, the AT&T chief seemed adamant that outside distribution deals with internet-based services like Roku, and the forthcoming Apple TV Channels, include viewer information. Access to customer data is "critical" and "foundational" to AT&T's overarching media distribution strategy, Stephenson said, implying that all deals concerning WarnerMedia properties include some type of data sharing provision. Sorkin asked if that included Apple. "Just pick the one you want to pick, we will have access to data," Stephenson said. "It's critical to everything we're trying to do. It's critical to the content creation algorithm, it's critical to advertising delivery, it's critical to marketing. It's really critical to everything we're trying to do." The revelation runs counter to assurances made by Apple in introducing Apple TV Channels. Introduced by vice president Peter Stern, Channels is an upcoming Apple TV feature that will allow customers to subscribe to premium networks directly from the TV app. AT&T's HBO is on the launch list, as are Showtime, Starz, Cinemax, Epix and more. As with nearly all of Apple's Monday announcements, Stern hammered home the company's dedication to user privacy. "The Apple TV app delivers on all these principles, including out commitment that we won't share your personal information with anyone," Stern said, alluding to features like expert curation, personalization and family sharing. It should be noted that while Apple said it does not allow data sharing like advertiser tracking on Apple News+, or similar methods with Apple Card, the company did not make the same overt promises for Apple TV Channels. AppleInsider reached out to Apple for clarification and will update if a response is received. Apple TV Channels is set to debut in May alongside an update to the TV app. Prices for premium services have not been revealed, though some predict subscriptions to run $10 per month.